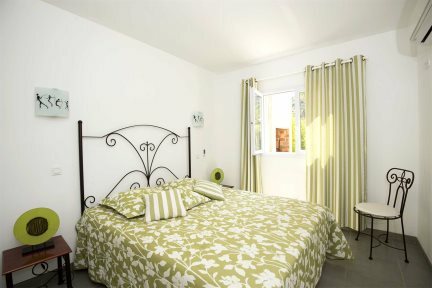 Résidence Mare e Macchia is close to the beautiful beaches and coastline of the region. Situated in the small and secluded village of Tizzano on the south western coast of Corsica, this recently built résidence is the ideal base for an off the beaten track getaway by the sea. Capu di Senetosa and Campomoro, which offers some of the wildest and most stunning coastal scenery in Corsica. Sartène, said to be “the most Corsican of Corsican towns”, is within easy reach for a day trip as are the beaches of Tralicettu and Roccapina, both with soft white sand and crystal clear water. For an evening out, try L’Escale, a popular restaurant by the marina or venture out to Propriano for a greater choice of amenities and livelier atmosphere. Open-plan living/dining area with kitchen, two double bedrooms, bathroom with wc, shower room with wc, terrace. A further bedroom with bunk beds in the three-bedroom apartment. Shared pool (19m x 6m, depth 0.5m-1.45m), toddler’s pool (depth 0.3m), barbecue, dishwasher, microwave, washing machine, television, Wi-Fi, air-conditioning. Open-plan living/dining area with kitchen, two double bedrooms, one bedroom with bunk beds, bathroom with wc, shower room with wc, terrace. A remote and laid back seaside village on the south west coast of Corsica. The area is largely unspoilt with a few holiday homes, a fabulous beach and a secluded marina surrounded by some exceptionally clear seas. A fantastic place for those looking to explore some of the most stunning coastal landscapes on foot. Follow the marked trails along the coast and discover a string of little creeks and giant boulders of granite rocks. Just south of the village, Tizanno has a glorious beach of golden sand. Here you can rent kayaks and windsurfs. Explore further afield and discover a string of even more enticing little coves along the coastline. Before you reach the village of Tizzano from Sartène, turn left and follow the dirt track for approximately 15 minutes and find yourself on a stunning beach of white sand and azure blue waters. A real paradise for the beach lovers. A dazzling turquoise-blue bay of perfect white sand and clear water. Above the beach is the famous lion-shaped rock formation “le lion de Roccapina”, crowned by an old Genoese watchtower erected at the start of the 16th century. A wonderful, sandy beach. To get there head towards and past Sartène and turn left heading towards Campomoro. After 3km you should park and take the small path towards a long sandy beach greatly appreciated by children as the water is shallow – at least on the first part of the beach. If you go further to the right, take care as the beach shelves steeply into the water. Actually located in the pretty fishing village itself, it has fine sand and turquoise shallow water making it an ideal choice for children and for snorkelling. With many good restaurants and cafés along the charming natural port it is a perfect place to sit and relax. The beaches nearby are never too busy and offer various water sports, sailing and diving. The best way to discover the region is by foot. Head up the coast to the Capo di Senetosa, a remote headland crowned with a bleach white Genoese tower. The scenery is superb. Prepare yourself with plenty of water, food and sun protection and of course the correct footwear. The Valinco area is rich in history. Visit the magnificent archaeological site of Filitosa whose famous sculpted menhirs always attract a few visitors. Other magnificent sites are more likely to be found by accident, so well are they hidden in the unique Corsican heathland, the maquis.